The ultimate sleep and study nook! 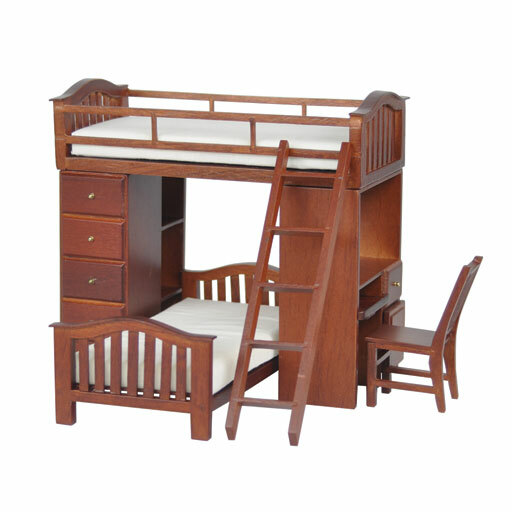 This miniature bunk bed is wooden with removable mattresses, slide-out keyboard tray, storage shelves, chair and removable ladder. Non-working drawers; door opens. Simple assembly is required for the dollhouse loft bunk-bed (six pieces). on 5/29/2014 Drawers do work! Very nice, the assembly mentioned is just stacking the loft bed on top of the desk and bookcase pieces!